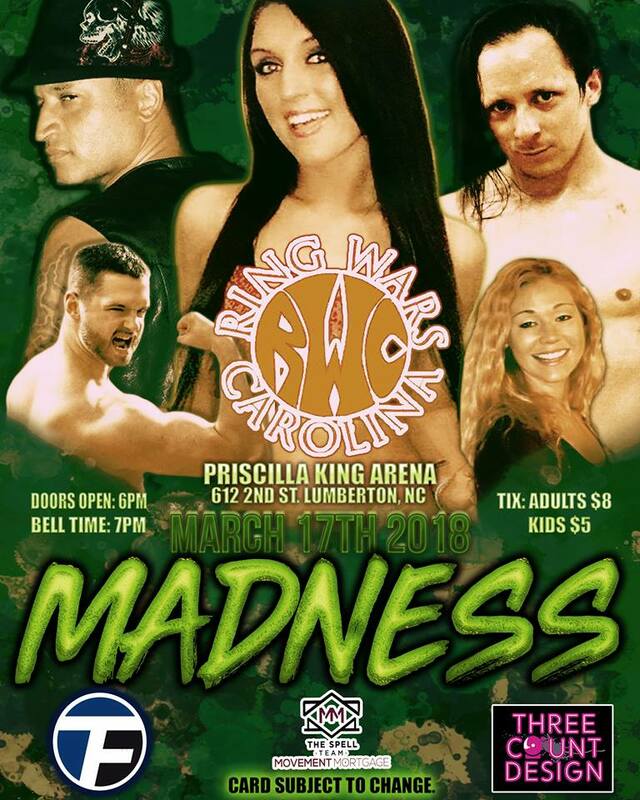 Ring Wars Carolina: Upcoming Event: "Madness"
March Madness is an under! Its a time for basketball tournaments and all the hoopla that comes with it. But here in RWC, its a whole new entity! Nothing was settled in the Andrews/Lebeaux Last Man Standing match on Feb 3rd. If anything more excitement and chaos is going to be added with Travis "Mason Jar" Dixon, Nite-Stic Eddie Brown in a Tag Team Tables match! Dani Ferrera made her debut back in January as the surprise partner of Syde Effect against the team of Hangtyme and Lynzee Pike and came up short that night. Lynzee has now issued a challenge to Dani for another match but this time to keep her from cheating General Manager Primetime has made it a LumberJack Match. James issued a challenged to Devin & Drew for a tag team match with a mystery partner who will not be from RWC Roster. Devin Worthy & Drew Thomas vs James Anthony & ????? ?